Those who died building the Brooklyn Bridge did not die in vain because they provided greater safety for millions. Workers were injured during the construction of the bridge and there were 27 known deaths. Workers fell, were hit by loose cable strands, and were caught in the drums. Many workers were trapped under a derrick on top of the Brooklyn tower. In addition, numerous workers suffered "the bends" while constructing the underwater caissons. These brave men built a strong bridge that was made of steel and supported by caissons that protected the safety of millions of travelers once it was built. 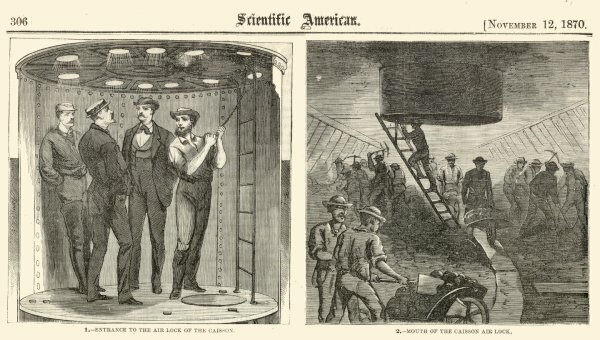 Workers inside the caisson air lock during the Brooklyn Bridge's construction. 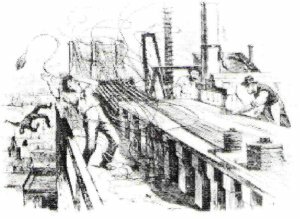 Sketch of a cable wire fatality. The Brooklyn Bridge provided a safer way to travel between Brooklyn and New York City than was available with the ferry boats. Before bridges and tunnels, The Fulton Ferry was the only way to travel between Brooklyn and Manhattan. Accidents on the harbor were a common occurence during the time of ferry boats. Ferry boats would often collide with passing freighters, steamers, oyster boats, and other ferries on the water. 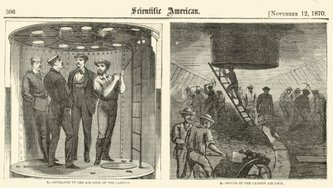 As described in the Harper's New Monthly Magazine in 1883, severe weather made traveling on the ferries dangerous as they would often get stuck in ice gorges. During more modern times, the Brooklyn Bridge has also provided a safety route during emergencies. 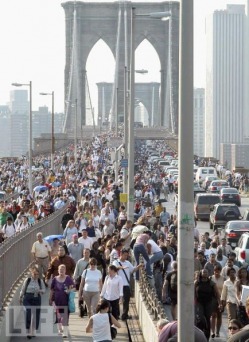 After the 9/11 terrorists attacks on the World Trade Center and the Blackout of 2003, thousands of pedestrians walked across the Brooklyn Bridge to safety.